In a place where many of the best fighters in Southern California started their pro careers, several prospects performed at Quiet Cannon golf course in Montebello, California on Friday. From lightweights to middleweights several prospects at the All Star Boxing event performed to expectations. Who will be the next Mikey Garcia, Murat Gassiev or Isaac Dogboe who all entered the boxing ring at this same venue early in their careers? A lightweight clash saw Michael Norato (7-0) win by unanimous decision after six rounds against veteran Luis Gerardo Avila (8-17-3). No knockdowns were scored as the tall lefty Norato kept his undefeated streak intact. In a middleweight match, North Hollywood’s Martin Saldana (10-0, 5 KOs) stopped Juan Jose Valenzuela (5-13-2) in the third round when the referee stopped the fight. Valenzuela has not won a fight in two years after eight fights. Welterweight prospect Jhon Sanchez Leon (6-1-1) won by knockout in the fourth round of a bloody fight over David Morales (2-3-1). Head butts caused cuts on both fighters but a badly swollen eye on Morales forced the fight to be stopped at two seconds of the fourth round. Vardges Vardanyan (6-0) won by unanimous decision after four rounds in a super welterweight clash against veteran Tavorus Teague (6-25-4), who despite many losses has a lot of skills. Vardanyan was making his third appearance at the Quiet Cannon and brings a lot of fans. A super featherweight contest saw Roger Gutierrez (7-3-2) and Emmanuel Castro (2-5-1) fight to a split draw after six rounds. The judges scored it 59-55 for Gutierrez, 55-59 for Castro and 57-57 for the split draw. 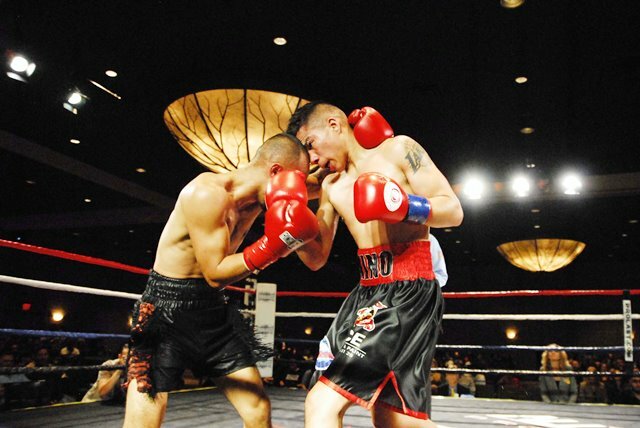 A featherweight match saw Alexis De Luna (4-0) defeat Daniel Bastien (4-12) by unanimous decision after four rounds. De Luna fights out of Bakersfield, Calif. and is only 18. Bastien was the first opponent who lasted the distance against De Luna.